Immigration to Canada: Visa Types You Should Be Aware Of! Canada is a nation of opportunities. Whether you are a skilled worker, a student, a business owner or a just a casual visitor, there is a range of visa program offered by Canada immigration. Each visa differs in its own criteria and purpose. Below is a list of visa types of Canada you need to know to immigrate to Canada or move to Canada for study, visit or work. Citizens of outer nations who are not a permanent resident and seek for Canadian education must apply for a Canada student visa. This visa is valid till the time of the chosen course duration. Some Universities of Canada also allow their candidates to work in-campus while studying and residing in the country on a study permit. Proof of funds to showcase your capability of paying tuition fees, managing living expenses, transportation, etc. It is to note here that these conditions do not imply to a foreign person who wishes to take up short term (six months or less) courses, is a foreign representative to Canada or a member of any foreign armed forces. In several cases, a positive LMIA from the Human Resources and Skills Development Canada (HRSDC) is sufficient to proceed with the work permit processing. This LMIA proves that when the Canadian employer was unable to fulfill his vacancy through the domestic workers, he offered you the respective job. Some Canadian jobs do not require LMIA as well. It is to note here that several occupants who perform clergy works, reporters or performing artists do not require a work permit too. One of the most commonly chosen work permits of Canada is the Post-Graduation Work permit. This is applied by students who have graduated and wish to work simultaneously while they study their Post-graduation in Canada. Till the visa is valid, you can study and work in Canada. The only condition is to have a course of study which is more than eight months. Provincial Nominee Program– for candidates with skills most needed by a province. To fill the vacancies faster of few Atlantic Provinces, the Canadian government started the Atlantic Immigration Pilot Program. Job offer is mandatory for this program. The benefit is the process takes less time and there is less constraint over work experience and English language skills. Quebec Immigration, though a province of Canada runs its own immigration system. The Quebec skilled worker visa program is a common visa program to settle in Quebec. The application and selection system of Quebec visa works on a first come first selection basis. However, processing time is longer than other types of Canada PR visas. With the increase in aging population and shortage of workforce to cater the caregiver vacancies, Canada is inviting relevant talent from outer nations. The Caregiver program is exclusively for candidates who are specialized in caregiver jobs or nursing. As a Canadian permanent resident or Canadian citizen, a candidate will have rights to sponsor his spouse, dependents and/or parents and grandparents. Family class immigration programs, spouse sponsorship, parent grandparent programs, super visa program etc. are some of the widely applied family immigration programs of today. If you are looking for any type of visa mentioned above, Kansas Overseas Careers is a one-stop Canada visa agency to fulfill all your visa process needs. Along with a reliable visa process, we as prime immigration consultants also provide assistance in finding a job, preparing for the IELTS exam through online training material and additional assistance. 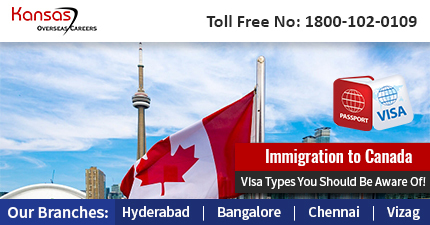 Consult our Canada visa agent today and know more about us @ 18000-1020-109 and know how we can help you in your immigration to Canada process.